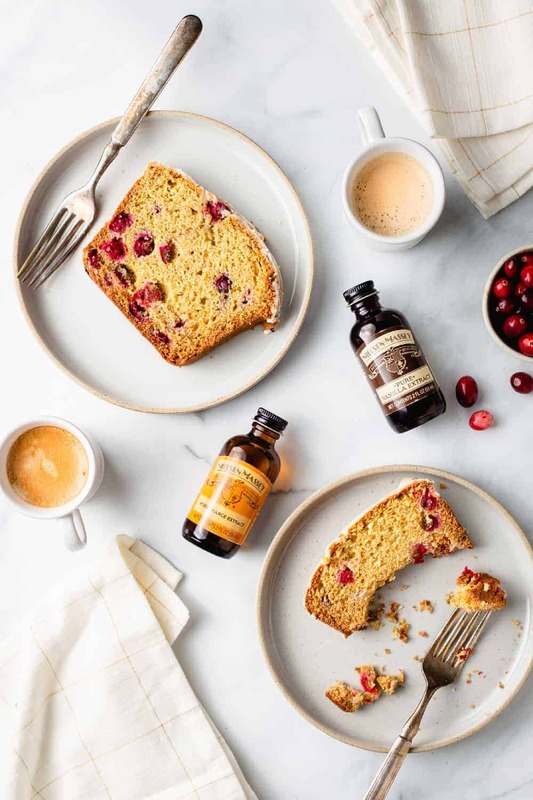 Cranberry Orange Bread is both sweet and tart, bursting with fresh cranberries and the flavor of oranges. Topped with an orange glaze, this bread is as beautiful as it is delicious, and makes for a delightful holiday breakfast or snack! This post is sponsored by Nielsen-Massey Vanillas. Thank you for continuing to support the brands that make My Baking Addiction possible. With Thanksgiving come and gone, you’d think I would have started to feel less stressed, but no, I still feel the crazy pressure of the holiday season. Still a thousand to-do lists to complete, still a ton of holiday parties to plan for and attend, still too many presents to buy and wrap. I’m always glad that the holidays go hand-in-hand with baking because baking is the thing that grounds me no matter how scattered and stressed I feel. I often like to bake really early in the morning before Eric and Elle are awake. Baking in those early hours calms me and helps set the tone for my day. Sometimes I turn on a TV show while I bake, sometimes I will listen to podcasts. Sometimes I just sip my coffee while I whip up whatever recipe I am testing that week. Either way, I can often tell later in the day if I haven’t taken that time to bake in the morning, simply because I feel more stressed in the afternoons. Some people have yoga. I have my mixer and oven. Hey, we all have our own types of therapy, right? This week’s morning baking had me whipping up some quick breads to share with my neighbors, including today’s Cranberry Orange Bread recipe. Now that Thanksgiving is over, what I like to think of as “pumpkin season” has come to a close as we head into a season of more festive holiday flavors. One of my favorite holiday flavor pairings is cranberry and orange. 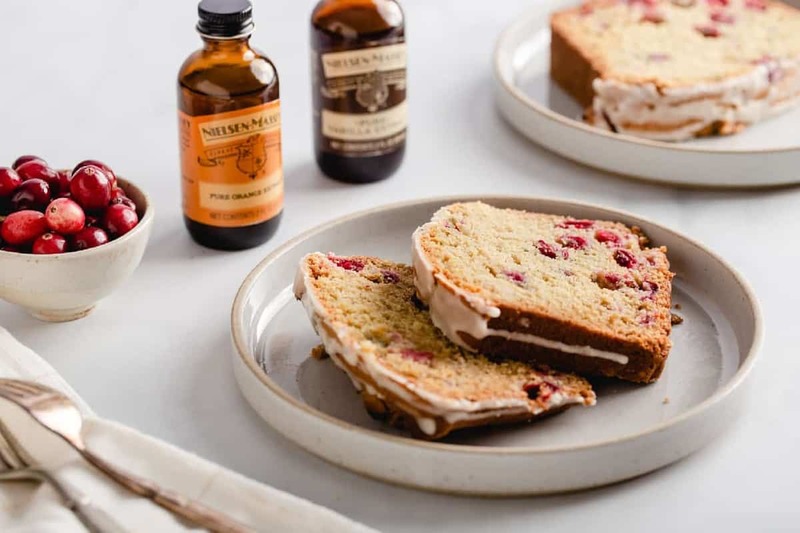 It’s a flavor combo I’ve turned to many times over the years, from Cranberry Sauce with Grand Marnier and Cranberry Orange Scones to Orange Cranberry Cookies and even a Cranberry Orange Smoothie. 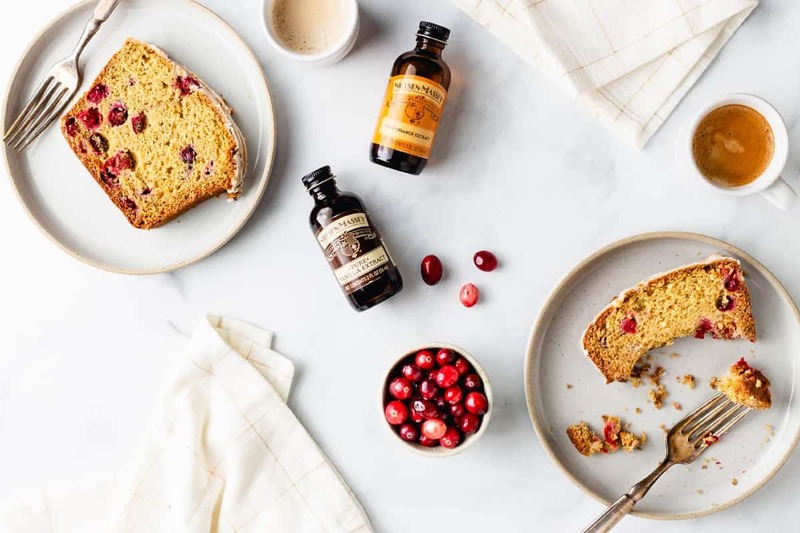 Given how much I love to make Pumpkin Bread during the fall, it only made sense to take my favorite cranberry-orange combo and infuse it into a quick bread recipe for the holidays. 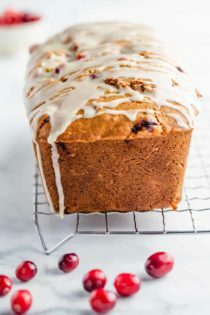 This Cranberry Orange Bread is bursting with tart fresh cranberries that I balanced with the sweet flavor of oranges. The whole thing is topped with a sweet orange glaze, making it as beautiful for a holiday spread as it is delicious. 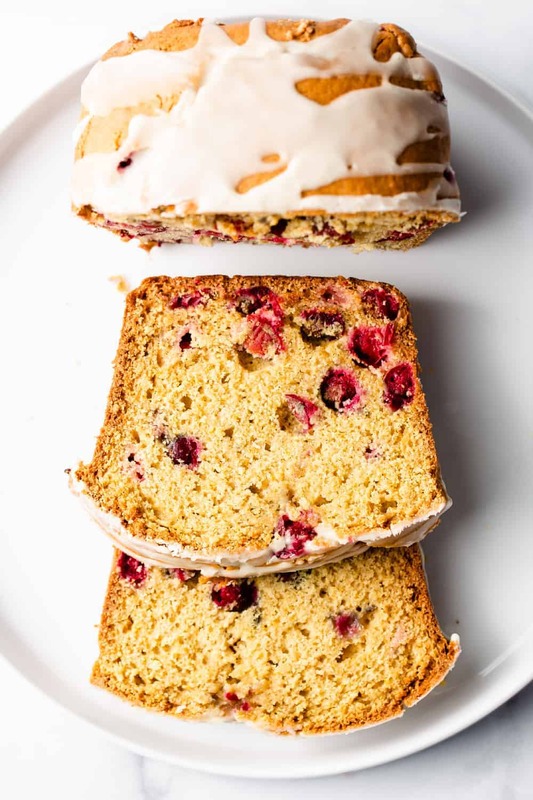 I’m just going to come out and say it – I really, really love this Cranberry Orange Bread recipe. 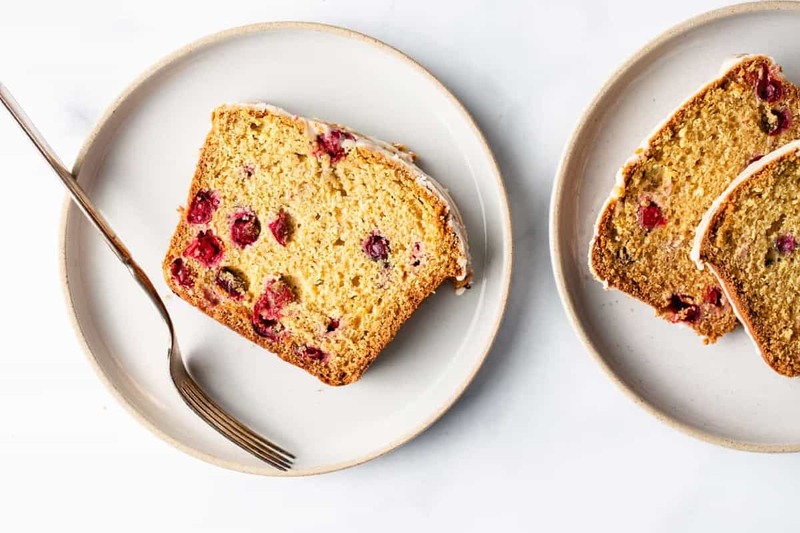 Bursting with whole cranberries and sweetened with orange juice, this is a bread I know I’m going to be coming back to again and again – probably multiple times yet this year. I wanted to make sure that the bread had some additional depth beyond just the flavors of the cranberries and oranges, though. When I want to give a baked good some extra depth, I always like to reach for vanilla. Specifically, I like to reach for my Nielsen-Massey Pure Vanilla Extract. I love how their proprietary cold extraction process preserves the more than 300 flavor compounds in vanilla beans, making it the most flavorful vanilla I’ve ever tried. And let’s be real, when holiday treats are on the line, I just don’t have time for anything less than the best ingredients! To really take this Cranberry Orange Bread recipe over the top, I added an orange glaze on top. For the glaze, I reached for Nielsen-Massey’s Pure Orange Extract to add that burst of orange flavor. I knew I could trust their orange extract to be just as flavorful as their vanillas for the same reason, since they only use the best ingredients and always extract them with the greatest care. 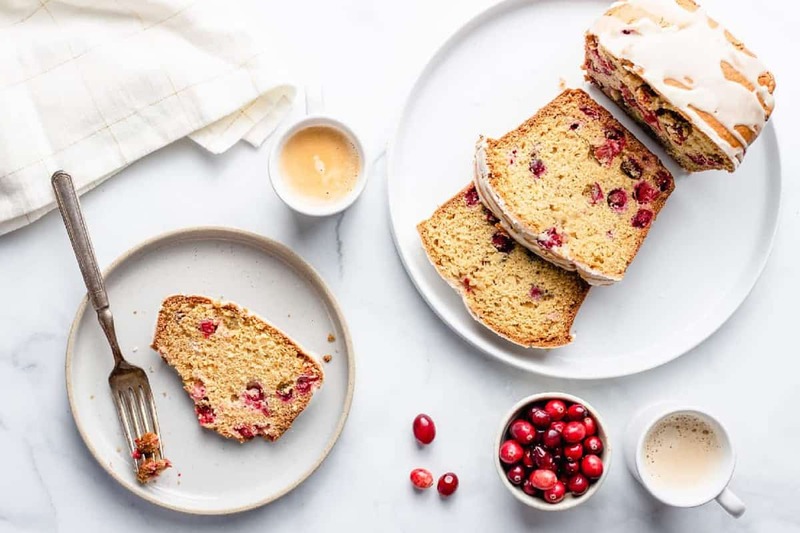 If you choose to make and freeze your Cranberry Orange Bread ahead of time, wait until just before serving to add the glaze. No one will guess the bread wasn’t baked fresh that day! 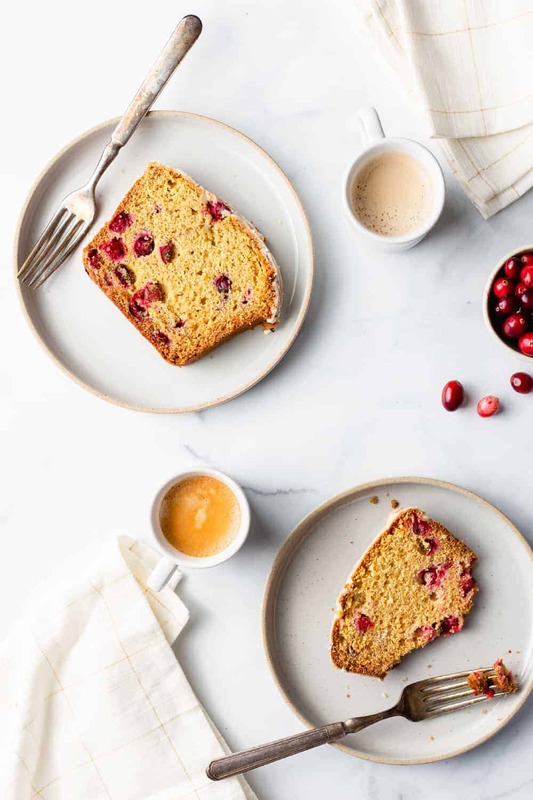 Whip up this delicious Cranberry Orange Bread for a holiday breakfast or snack with a cup of coffee, or gift a loaf to a friend or neighbor to share some holiday cheer. It’s absolutely delicious and perfect for the season either way. 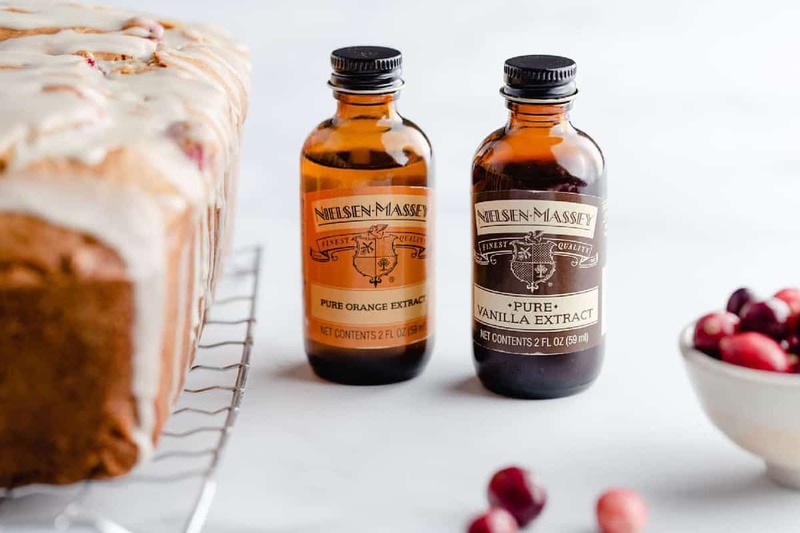 For even more recipe inspiration, follow Nielsen-Massey Vanillas on Facebook, Instagram, Twitter, and Pinterest. Preheat oven to 350 degrees F. Spray a 9×5-inch loaf pan with nonstick cooking spray. In the bowl of a stand mixer fitted with the paddle attachment, or in a large bowl with an electric mixer, mix the sugars and orange zest until the sugar is fragrant and the orange zest is thoroughly incorporated. Add in butter and mix until light and fluffy. Add in the egg and vanilla and beat to combine. Add in orange juice mix until incorporated. Gradually add in the flour mixture and stir until just combined. Stir in buttermilk. Do not overmix. Fold in cranberries. Spoon batter into prepared pan and bake in preheated oven for 60 minutes. Allow bread to cool in pan for 20-30 minutes before removing to a wire rack to cool completely. Once bread is cool, whisk together the powdered sugar, orange juice and orange extract. Drizzle over bread and allow it to harden before serving. If glaze is too thick, gradually add a few drops of orange juice at a time to achieve the desired consistency. Use parchment as shown in the photos and liberally spray with nonstick cooking spray. I used Simply Orange Juice. Allow the bread to completely cool before glazing. Allow the glaze to harden before cutting with a serrated bread knife.